Through extensive partnerships, recruitment, marketing, and training, the national Safe Harbour: Respect for All program continues to expand at a rapid pace in 15 communities in Alberta, seven in Manitoba, and three in Newfoundland. There are currently a total of 12 Safe Harbour-certified locations throughout Brooks. The Global Friendship Immigration Centre is excited to announce that the City of Brooks and the Chamber of Commerce are now actively participating as Safe Harbour-certified locations. The Chamber is promoting Safe Harbour through their website, e-bulletin and newsletter to members. The City Hall, the recreation centre, the arena, and the fire hall are on board as new Safe Harbour locations. The City of Brooks has decided to proclaim the first Tuesday of the month as Respect for All Day. A diversity-related activity will happen on that day, such as a Safe Harbour workshop, a diversity workshop, a lunch & learn, or a media release promoting Respect for All. 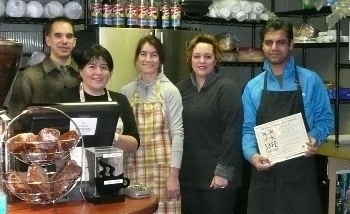 The Winnipeg West End Biz, Downtown Biz and Ten Thousand Villages are excited about Safe Harbour. Momentum is growing thanks in part to an article in the Russell Banner and an impressive interview on the CBC Morning Show given by Manitoba Interfaith Immigration Council. Community Organizers were recently trained to deliver the Safe Harbour program. Through initial outreach, all of the public libraries in St. John’s have decided to come on board with the program. With over 650 Safe Harbour locations in BC, some of newest Safe Harbour locations include: managers from 34 branches of the Vancouver Island Regional Library in Nanaimo, Trinity Western University in Langley, and Tourism Abbotsford at the Abbotsford Airport. The BC Safe Harbour program will be holding four Regional Meetings in January in Kelowna, Vancouver, Abbotsford, and Nanaimo. At these Regional Meetings, Safe Harbour Community Organizers will have the opportunity to network, share their ideas, experiences, as well as provide feedback on upcoming priorities for the Safe Harbour BC program. AMSSA will be launching a new webpage for Safe Harbour sites in mid January 2010. The webpage will include Safe Harbour workshop resources available for download, additional tips, resources and sample tools that sites may use to further their organization’s cultural competence. Mission Community Organizer Kusum Soni was recognized and interviewed as the subject of OMNI Television’s weekly Women in Focus program in December 2009. During the interview, she introduces the Safe Harbour program to audiences as well as talk about her involvement with Safe Harbour. 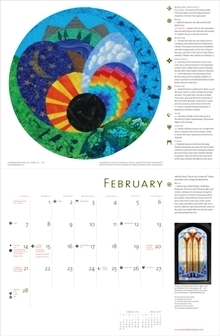 2010 Multifaith Calendars – Have Ordered Yours? 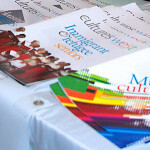 Sales of the 2010 Multifaith Calendar have been great. There are still some left but they are going quickly. AMSSA recently helped to establish the new BCSAP Reference Group, a provincial committee of 13 representatives from BCSAP service providing organizations (excluding ELSA) in the Vancouver, Fraser Valley, Vancouver Island, Interior and North regions. 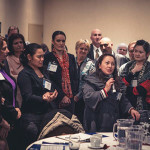 The new committee will provide a venue for the Immigration and WelcomeBC Branch (IWBC) and other relevant stakeholders to communicate and consult with a representative group of BCSAP contractors on broad sectoral topics and initiatives, and work together to improve service models and delivery. The BCSAP Reference Group will meet four times a year, and each meeting will include one or two main agenda items as well as a roundtable for service providers to identify new trends and emerging issues. AMSSA has just completed work on a new Users’ Guide for the website that will be available to all BCSAP Providers in January 2010. The guide should make the website easier for existing users and can serve as an introduction to the site for new employees. AMSSA will also be delivering Settlement Net training sessions to new and existing BCSAP service provider staff (based on need) from January – March, 2010. Later this year, AMSSA will be conducting a review and evaluation of Settlement Net through a survey of settlement workers across the province. We’ll be looking for feedback on everything from the design/look of the site to the value of currently posted resources to how the information is organized. A re-design or upgrade of the site will take place summer 2010. In the meantime, comments, questions, feedback and suggestions for improvement related to Settlement Net can be made by contacting Melissa McDowell, Settlement Projects Assistant, by phone at (604) 718-2783 or 1-888-355-5560 (toll free), or by email at projects@amssa.org. Goodbye Melissa Jay. Welcome Tsering, Nubia, Shona, Kim, Bivianna and Alex! AMSSA said goodbye to our Health Fair Assistant Melissa Jay in December. Melissa did a wonderful job on planning for the Health Fair and we wish her the best of luck with the rest of her studies at SFU. AMSSA welcomed six new members to our team in January. Alexandra is serving as Acting Sectoral Support Coordinator while Timothy Welsh is on leave. Kim is our new Health Fair Coordinator and Bivianna is the Health Fair Assistant. Tsering will be working on a project to review muticultural diabetes resources. Shona will be working with our members to plan a Diversity Expo, and Nubia will be assisting the settlement team with some upcoming events. AMSSA is very excited to have everyone on board and we are looking forward to a full and exciting spring. Planning for the 2010 Diversity Health Fair is well under way. Mark your calendars now as it is sure to be a fantastic event. The Fair will be held on May 29th at the Croatian Cultural Centre on Commercial Drive. We hope to see you all there!